Information: Alice E. Gillington, author of books about singing games. Breton Singing Games: Curwen's Edition 5703. Gillington, Alice E. London: Curwen. Eight Hampshire Folk-Songs: Curwen's Edition 5627. Gillington, Alice E. London: Curwen. Old Christmas Carols: Curwen's Edition 5702. Gillington, Alice E. London: Curwen. Old Dorset Singing Games: Curwen's Edition 5734. Gillington, Alice E. London: Curwen. Old Hampshire Singing Games: Curwen's Edition 5673. Gillington, Alice E. London: Curwen. Old Isle of Wight Singing Games: Curwen's Edition 5685. Gillington, Alice E. London: Curwen. Old Surrey Singing Games: Curwen's Edition 5668. Gillington, Alice E. London: Curwen. 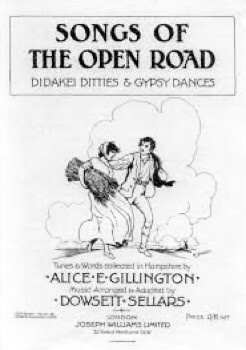 Songs of the Open Road: Didakei Ditties & Gypsy Dances. Gillington, Alice E.